The first day after we arrived, we had the opportunity to visit the places where St. Rose of Lima and St. Martin of Porres lived and worked. Sally Harper, the Vice Provincial was our tour guide. Lima is known as the City of Saints and there were plenty of them, including St. Rose of Lima and St. Martin of Porres both of whom spent their lives helping those less fortunate. As I began my transformative journey I was reminded also of the words of Pope Francis who said, “To touch the living God, we do not need to attend a “refresher course” but to enter into the wounds of Jesus, and to do so, all we need to do is go out onto the street.” And so we went out into the streets of Lima (the Sisters in any of the 5 houses have no car of their own, so we walked a lot). You can see much more by walking and have a greater chance of actually encountering people. This was a great learning for me, this walking with the people of Peru, and the realization that the work I do is never as important as the presence that I bring to the work. One of the retired sisters, Maria Dolores (Dolo) Munoz, who accompanied me to Tacna, was a living example and reminder of this. 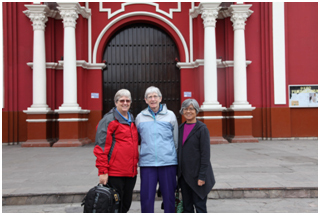 She is from Los Angeles and has ministered in Peru almost her entire religious life. When I asked her what she does in Peru, her response was that she is present to the people and sisters she lives with. And what a gift her presence is! 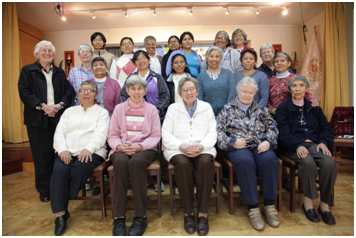 The sisters who live at the province house go out each day and bring the good news through their presence to many. Their ministries vary. Maria Elena Caceres, is a student. Maurice Carcasi, works mainly in the provincial house, Betty Conrad helps with bookkeeping for the house, Genoveva Herrera is a hospital visitor each day, Peg Murphy is the Vice Province Treasurer, and Maria Luz Salazar works in a school. Rosa Orellana is recovering from breast cancer and waiting to return to Puerto Rico to teach in a school there. Maria Schuh goes almost every day to a large prison, a prison without cells, where over 8,000 men live together with few guards. 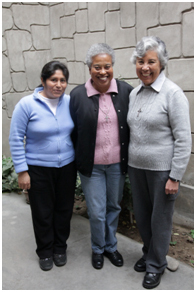 Maria and Anne Davis (who lives at Canto Chico) bring hope to these men.